Unless you have opposable thumbs, it's a long, long way from Mark's new automatic chicken coop door (labeled pophole) to our trailer. 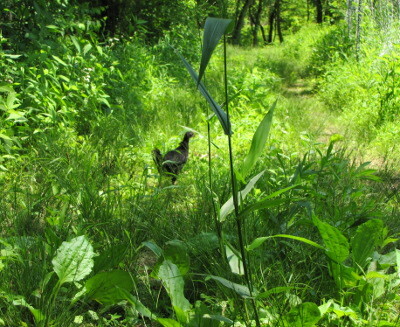 We can cut through the pastures, but a chicken has a choice of two exhausting options. 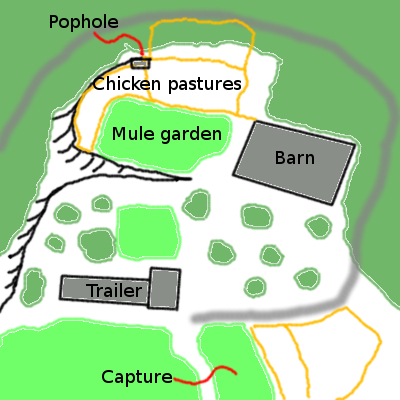 They can turn left outside the pophole and skirt the pasture fence for quite a ways, then bushwhack through briars and climb up the steep incline to the plateau that houses our homestead. Or they can turn right outside the pophole and follow the gentler slope of the driveway, traveling perhaps a tenth of a mile around the barn and into our farm proper. When our australorps started slipping under the gate and exploring the floodplain a couple of months ago, I was a bit concerned that they would make one of these treks and find our delicious garden fruits and enticing mulch. 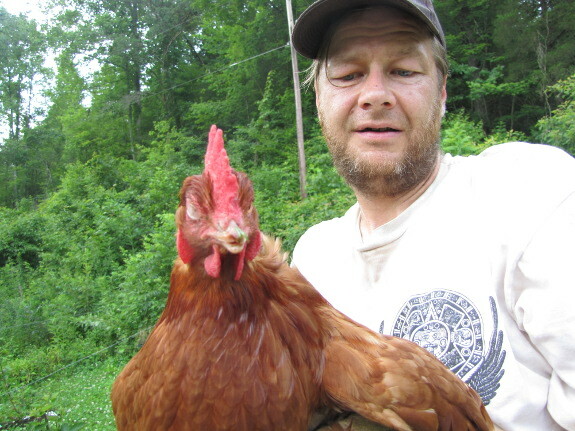 But I soon set my fears to rest --- even when I walked Lucy through our free ranging flock, the chickens stopped following me at the end of the pasture fence and headed back to the woods closer to the coop to look for easier pickings. I'd been considering opening a pophole directly into the floodplain so that the old girls could join these youngsters on their free range jaunts, but I was a bit concerned that an unfenced door into a chicken coop at the furthest limits of Lucy's usual patrols would be too much for predators to resist. Jeremy's automatic chicken door seemed like the answer --- I could let the chickens out to eat all that good food in the floodplain without worrying about predators. So as soon as Mark had the door in place, I opened it up and called our chickens to explore. 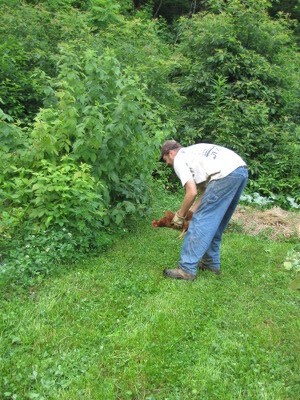 Less than an hour later, our ornery old hens were eating raspberries in our front yard. The good news is that the australorps didn't follow, so there's still a chance that my plan to let the chickens free range in the floodplain will work once we delete the old girls from the flock. But, for now, the pophole is shut and everyone is relegated to the pasture. I wonder if those few raspberries were worth such an arduous journey? Our chicken waterer quenched the hens' thirst with clean water when they got home. Fresh, sun-warmed raspberries are one of life's great pleasures! I'm sure those chickens are thinking that they were worth every step and that they'd take that journey again in a heartbeat . . . if only they could get out that door!